22cm3, 20"/50cm cut, double sided, easy start, single harness. Designed for medium height hedges. 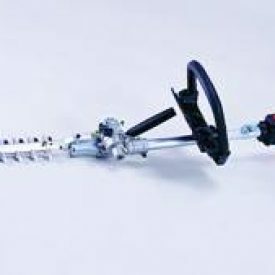 Additional information on the Tanaka TPH 230S Pole Hedge Trimmer. This versatile tool can be used as both brush cutter and hedge trimmer Tanaka's precision gear case creates an angle of 130° and 65° in total. Upwards angle makes it useful for ground cover applications as a brush cutter and downward angle is useful to trim hedge tops. EXT 200 (extension kit 600mm/0.6kg) Vibration and Sound Pressure Level (EU model) Testing and average are made according to CE Regulations. Column 1 Model number. Column 2 Vibration Level (m/2). Last Column Sound Pressure Level/db (A).